At the time of its construction, Athens’ Parthenon dominated the religious and civic aspects of the city, both conceptually and physically. This temple, poised above the city, served as a constant reminder of Athenian patriotism and religion. The Parthenon was constructed of white marble on a rectangular stylobate with three stairs. The temple was colonnaded with fluted Doric columns. The northern and southern sides had seventeen columns each while the East and West facing sides both featured eight columns. The latter sides additionally had a second row of columns of six apiece. Pediments were included at the conclusion of the gabled roof. These pediments housed figural sculptures. An architrave encompassed the perimeter of the structure below the roof. Under the band of stone was a frieze that featured low-relief sculpture through triglyphs and metopes. The interior cella was composed of a walled-off rectangular space divided into two separate spaces accessible on either end. The West-facing cella compartment had a small interior colonnade and housed the cult statue for the city. Construction on the edifice began during the mid-fifth century BCE under the orders of Athenian statesman Pericles. Greece was shifting away from the principalities ruled by monarchs and instead began ruling the various city-states through a government of councils and assemblies. This change in power dynamic affected Athens not only administratively but also architecturally. Temples were being raised in honor of the city-states’ patron deities, the collective citizens’ new focus rather than the kingship. These temples were essentially homes for the gods or goddesses with an internal cult figure statue. While the temples were religious in nature, they served an equal nationalistic and civic purpose as well. The Parthenon was constructed by locally quarried stone, something of which the Athenians were vehemently proud, and was located on a site with deep historical significance, the Acropolis. This natural citadel was elevated towards the heavens and had ties to ancient Greek rulers and mythology. Legend dictated that the Acropolis was the site in which Athena and Poseidon battled to determine who would claim the land of Attica. The two gods provided a gift to the citizens who then voted for the victor. Athena’s olive tree trumped Poseidon’s salt pools, and thus the city of Athena came into existence. The Athenians demonstrated their nationalism through the construction of their patron deity’s temple at the site of her famed victory and also the depiction of the mythic story on the West pediment. Further bolstering the idea of civic nature of the temples is the idea that it was not necessary in the practices of Grecian religion to have a temple to worship. In fact, the altar was often placed outside of the temple to be accessible to the masses because the interior of the temple, the cella, was reserved only to highest religious leaders. While the Parthenon lies in ruin today, stripped of its decoration, roof, and interior walls, the ritualistic and civic significance of Athena’s temple may escape the modern viewer. It is my hope that a reconstruction of the Parthenon through an investigation of object, style, and technique may encourage a better understanding of the structure’s form and function. To begin the reconstruction process, exact measurements were necessary. I was able to find several articles that provided detailed drawings and dimensions of the Parthenon. Working at a 1/100 scale, I drew several models and calculated my desired measurements. The ancient Greeks’ fervor for perfection and the architects’ mathematical prowess were extremely evident in my findings. Through the subtle change in column length and floor height, an optical illusion was achieved to feign perfection and counter the eye’s natural tendency to determine distance. This knowledge allowed me to tailor the columns and base to the proportions of the original Parthenon. To further assist with my reconstruction process, I discovered information regarding the rhythm, proportion, and technique utilized in Athena’s temple. This was instrumental in drafting and completion of reconstruction, particularly in reference to the restructured cella and interior colonnade. At the completion of my data research and mathematical conversions, I began the reconstruction process. I started with a wooden rectangular base and fashioned a styrofoam stylobate as the base. Using foam board, I constructed the three sets of stairs with mitered corners. I then measured the desired distances between all of the columns and inserted a short wooden dowel into the styrofoam. Focusing on the changing dimensions, I carved fifty-eight columns out of the styrofoam and capped them with Doric capitals of the same material. The cella walls were made from the foam board and pressed into the soft base. I created the smaller interior colonnade and columns out of dowels and styrofoam. To cap the reconstruction, I made a removable roof, including the architrave and frieze, out of foam board. The pedimental sculptures were composed of adapted ‘Army Men.’ I coated the entirety of the reconstruction with white spray paint to emulate the white marble of the original Parthenon. The development of reconstructing the Parthenon revealed clues to the original form and function of the structure. With the rebuilding of the cella walls, it became apparent the exclusivity and sanctity of the interior of the temple. Additionally, the thorough dedication to the preciseness of appearing perfect in this ancient Greek landmark divulged the values of the culture that constructed the temple. The reconstruction process of the Parthenon provided insight into its form and function based on the object, style and technique of the structure. 38, no. 2 (1994): 14-15. Architecture.” Music in Art 32, no. ½ (2005): 5-16. Classical World 91, no. 1 (2003): 41-55. Encyclopedia Britannica Online, “Parthenon,” Accessed April 16, 2015,http://www.britannica.com/EBchecked/topic/444840/Parthenon. Walter R. Agard, “Athens’ Choice of Athena,” The Classical Weekly 38, no. 2 (1994): 14. Christopher Ritté, “Athens: Recreating the Parthenon,” The Classical World 91, no. 1 (2003): 43-45. Athanasios G. Angelopoulos, Metron Ariston (Athens: Aeropos, 2003), 275. Jay Kappraff and Ernest G. McClain “The System of Proportions of the Parthenon: A Work of Musically Inspired Architecture,” Music in Art 32, no. ½ (2005): 12. When the Parthenon was constructed in the 5th century BCE, Athens was thriving as a democracy under the rule of Pericles. This temple was built to honor the patron deity of Athens, Athena. This goddess’ attributes of intellect and warrior prowess reflected ideals that the Athenians revered. As a warrior culture with extreme civic pride, Athena’s Parthenon was the focal point of the Acropolis and visible from around the city of Athens. Decorative marble sculpture series adorned the pediments of the sculpture. These marble sculptures depicted scenes from Greek mythology, such as the birth of Athena and Athena’s victory over Poseidon. As a culture that lived by the notion that any non-Greek person was barbaric, the marble statues of the Parthenon stood as reminders to Athena’s people of Greek and Athenian supremacy. More than two millennia after completion of the Parthenon and the decorative marble statues, Athens was no longer that mighty republic thriving under Pericles but was subjected to Ottoman authority. A British ambassador to the Ottoman Empire, Lord Elgin, was fascinated with the concept of classical Greek history and took particular interest in the Parthenon’s marble statues while visiting the Acropolis. Initially the ambassador only called for sketches to be made of the statues. After concluding that the marbles were suffering in situ, he removed the pedimental sculptures, metopes, and portions of the frieze to return to England. It was later sold to the British Museum of Art where it still resides. Today much controversy surrounds the ownership ‘Elgin Marbles.’ Both the British and Greeks argue that each have legal and moral claim over the Parliament’s marble adornments. The British defend their ownership of the marbles based on Greece’s lack of an adequate museum and the fact that they paid for the pieces (McGuigan 2). They further bolster their argument claiming that Western culture including Britain is a product of Greek antiquity, thus the Elgin marbles are part of British history as well (The British Museum 2). The Greeks counter this claim of ownership by building a new Acropolis Museum in 2009 while making extra effort not to disturb any ancient cultural sites (McGuigan 1). Furthermore, the Greeks liken the removal of the marbles to the Nazi plundering of art during World War II (Kimmelman 2). Due to their initiative of preservation and the heritage of the objects, I believe the Elgin Marbles ethically and legally belong in the possession of the Greeks. It is my opinion that the Elgin Marbles are legally and ethically the property of Greece. Because this issue of ownership is extremely controversial and prevalent today, many believe that the case of ownership should be considered in a modern court. It may be difficult for the legality to be settled in court today, but I do not believe that it is impossible or unadvisable. I do not think there should be a statue of limitations on the looting of a cultural treasure. Greece’s former cultural minister, George Voulgarakis, compares Elgin’s taking of the marble statues to the Nazis plundering priceless art during World War II (Kimmelman 2). Still today Nazi looted art is being returned to their legal owners as an act of atonement for those atrocities. A court case regarding the possibility of the Elgin Marble’s return to Greece could be handled similarly to the homecoming of Nazi looted works. I believe that the Greek government has the greater claim to the Marbles for various reasons. Initially I do not believe that Elgin had the legal authority to remove the marble statues from the Parthenon. Additionally, Elgin’s supposed motivation behind removing them, the lack of the ability to conserve the works, is now invalid. A new Acropolis Museum was constructed in 2009 a mere thousand feet away from the Parthenon. The Greeks now have a worthy space that can preserve and display their national monument just steps from its original location. Furthermore, after discovering an ancient settlement on the construction site, the museum’s plan was altered by elevating the structure on columns and utilizing a glass floor to allow for a view of the excavation (McGuigan 1). This new museum and its subsequent alterations demonstrate the Greek government’s desire for maintaining and preserving its culture. Though I believe there is an inherent difference between a moral and legal right to ownership, I personally consider Greece to be both morally and legally the rightful owners of the Elgin Marbles. Morally, the marble statues are a vital part of Athenian culture and should belong to the nationalistic Greeks. 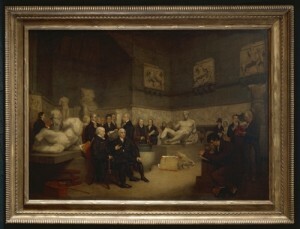 Legally, I don’t believe that Lord Elgin had permissible right to remove the statues, thus his selling them to the British Museum of Art was not legally right. When determining which right of ownership is more pressing, Voulgarakis states it best: “The problem is not legal. It’s ethical and cultural…The Acropolis is special” (Kimmelman 2). I believe that modern courts have an obligation to overturn past legal actions if they are contrary to what is correct for modernity. Without progressing from the past, there can be no advancing to the future. The removing of the marble sculptures during an unstable moment in Greece’s history may have appeared benevolent during the early 19th century, but today they should be returned to the civilization that is prepared to care for its cultural treasure. There are guaranteed to be issues arriving from modern courts overturning past legal actions, such as general opposition to the idea and an influx of reconsidered cases, but correcting a previous action for today’s society is too important to be stymied by potential controversy. Because of its ongoing preservation efforts and the legacy of the objects, I believe that the Elgin Marbles belong to the Greek government. The marble statues of the Parthenon were taken during a vulnerable time for the Greeks, and today they have proven that they are deserving and able to own the Elgin Marbles. These objects are a significant part of Athenian and Greek history, a culture founded on nationalistic pride. I believe that based on Greece’s efforts and heritage, the Elgin Marbles should be repatriated to Athens. The New York Times, June 2009. “The Parthenon Sculptures.” The British Museum. http://www. According to Greek mythology, Ariadne was the daughter of Minos, king of Crete, and his wife Pasiphae. Minos was charged by Poseidon to care for a dangerous Minotaur in a labyrinth and offer it human, Athenian sacrifices every nine years. On the third cycle of sacrifices, Athenian prince Theseus volunteered to go with the sacrifices and slay the beast. Upon meeting the Athenian hero, Ariadne fell in love and devised a plan to help Theseus escape from the labyrinth and the hybrid creature. She secured a string between herself and Theseus so that he may kill the Minotaur and safely find his way out of the labyrinth. The plan was successful, and the two lovers escaped to the island of Náxos. Ariadne soon fell out of favor with Theseus, and the Athenian abandoned the Cretan princess on the island. She was eventually rescued by and married the god Dionysus. He raised her as an immortal, the goddess of vegetation, and placed her marital crown in the sky as a constellation (Encyclopedia Britannica Online, 1). The long, oral tradition of the myth of Ariadne was written down in Ovid’s Metamorphoses in the first century CE. This epic poem documents the lives of gods and goddesses from Greek mythology, particularly in relation to change and love. In the book regarding Ariadne, Ovid charts the rapid peaks and plummets of love between Ariadne and her suitors (Ovid, 384-385). This consistent motion, further reflected in the cyclic movement of her constellation, is a concept important to ancient Grecians, particularly in relation to the seasons and associated vegetation. The ancient Greeks relied on the cyclic patterns of vegetation for their food source. This mythological tradition of Ariadne supported this idea and allowed for a physical representation that they could worship to ensure a successful harvest (Webster, 22). The Marble Sarcophagus with Garlands and the Myth of Theseus and Ariadne is an ancient example of an object containing imagery of Ariadne. This object, discovered in 1889 near Rome, is a marble sarcophagus intended to hold human remains. This Greek myth would have been popular among the Romans due to the popularity of Ovid’s epic poem and its subsequent influence on Roman culture. The imagery on this object depicts both the attributions of Ariadne as a goddess of vegetation as well as the myth surrounding her and Theseus. The concept of vegetation goddess is evident in the sarcophagus through the flora, erotes, and animals. Depicted in shallow relief on the lid, four winged erotes drive chariots pulled by a bear, lion, bull, and boars. These beasts are associated respectively with spring, summer, fall, and winter. On the front of the piece, swaths of garlands featuring wheat, flowers, and fruits further represent the idea of vegetation associated with the Greek goddess. This series of vegetation-related imagery bolsters the idea of the ancient Greek and Roman dependence on a deity for their seasonal harvests. Further adding to the relief imagery on the sarcophagus, three installments of the myth’s narrative are positioned between the draping garlands. They represent Ariadne assisting Theseus with the string, Theseus slaying the Minotaur, and Ariadne abandoned on Náxos awaiting Dionysus (“Marble sarcophagus,” 1). This representation of a Greek myth on a roman sarcophagus denotes the culture’s interest in the literature produced by Ovid. Greece & Rome 13, no. 1 (1996): 22-31.